If you remain still, I will do your fighting for you. 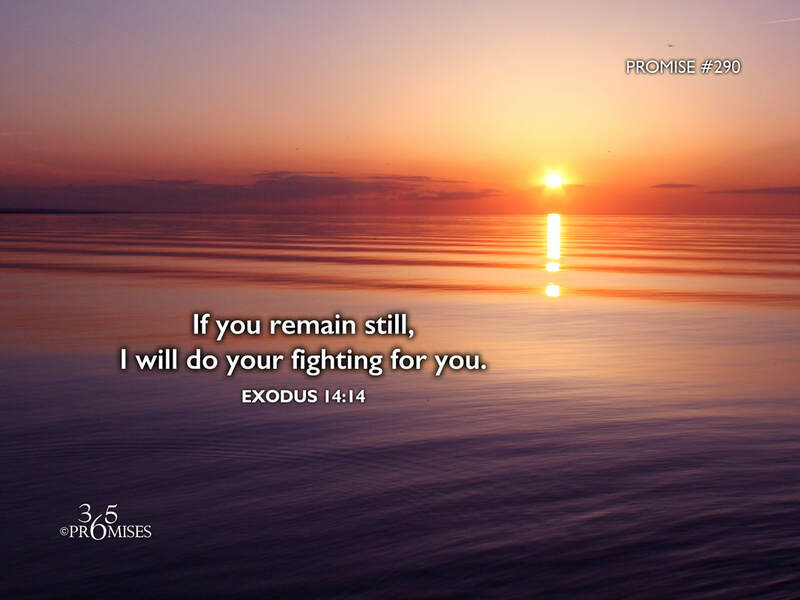 In today's promise, we have an amazing assurance that the God who spoke the entire universe into existence will fight for us if we will only remain still. The NIV Bible says this verse this way...The LORD will fight for you; you need only to be still." I believe there is something in the heart of God that fights on our behalf when we do not try and fight for ourselves. Waiting on the Lord is not passive, but it is the most active thing we can do. When we wait on God to fight for us, we are putting ourselves in a very vulnerable position and by doing so, we are demonstrating in a very practical way that we know that our heavenly Dad is the source of our help. Does this mean that we never wage warfare on a spiritual level? After all, the Bible says that we are to 'resist the devil and he will flee', 'take on the full armor of God', etc. I believe what Exodus 14:14 is talking about is fighting in our own strength. There is a huge difference from fighting our battles in our own best efforts and fighting battles in the power of the Lord's might. When we learn that the battle really is the Lord's, we can rest in His ability to save us and draw from His strength and not our own. Whatever battle you are facing today, be comforted in knowing that you have a Father (God) and a Big Brother (Jesus) fighting on your behalf. You only need to be at peace and watch what happens.